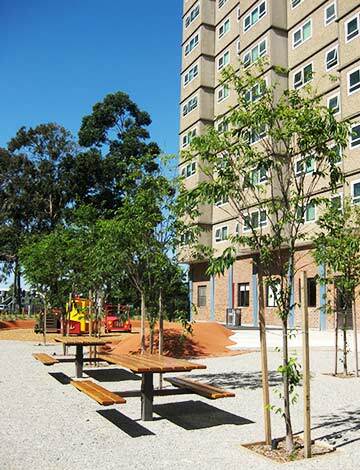 Following the success of the Holmes Street Community Gardens, the Department of Human Services sought Green & Dale Associates’ involvement at another of their high-rise towers, at 120 Racecourse Rd, Flemington. 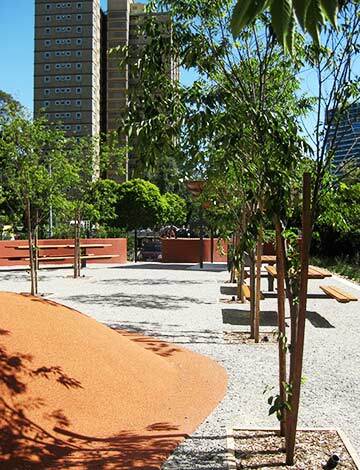 The brief was to create a gathering and play space for residents of the tower that would integrate with the newly designed adjacent parklands. An initial community / resident consultation led to the compilation of a report by GDA which outlined some of their desires and concerns, including worries over privacy and security, the proximity of the busy Racecourse Rd, and high winds. Further, the tower’s resident population was culturally and ethnically diverse, with broad ranging needs which needed to be acknowledged. The resulting design was set around a large play ‘snake’ and play structures, integrating the design with the adjacent parkland’s design. 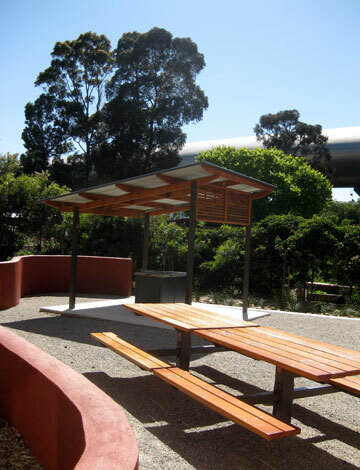 A shelter and BBQ was incorporated to one end of the site, with seating designed to cater for large groups, all set in a courtyard with advanced Zelkovas to provide further shelter and seasonal interest. A second, smaller courtyard provides a quiet seating area to the opposite end of the site, as well as allowing parents of small children to watch them whilst they play. Protection from prevailing winds was integrated using a vegetated berm, which has the added benefit of visually screening the site from Racecourse Rd.